Once an email message has started sending, you are able to pause the message send. You discover an issue on your site or landing page that needs to be resolved after you've sent a message. Before the message has completed sending you can pause message sending. Once the issue on your site is resolved, you can resume sending. If you need to make changes or edits to the message itself, you should use the cancel message functionality. Locate the message in the Email Sent list. Hover over the arrow next to the message name and select Pause. A pause icon will appear next to the send time. Hovering over the message send time will display more info about the send. When an email message send is paused you are able to resume the message send. Hover over the arrow next to the message name and select Resume. Timezones that have passed during the window which the message was paused will send upon resume. For throttled messages, the batch that was paused will complete upon resume. The next batch will go out at the eligible scheduled send time (unless the end date has passed). 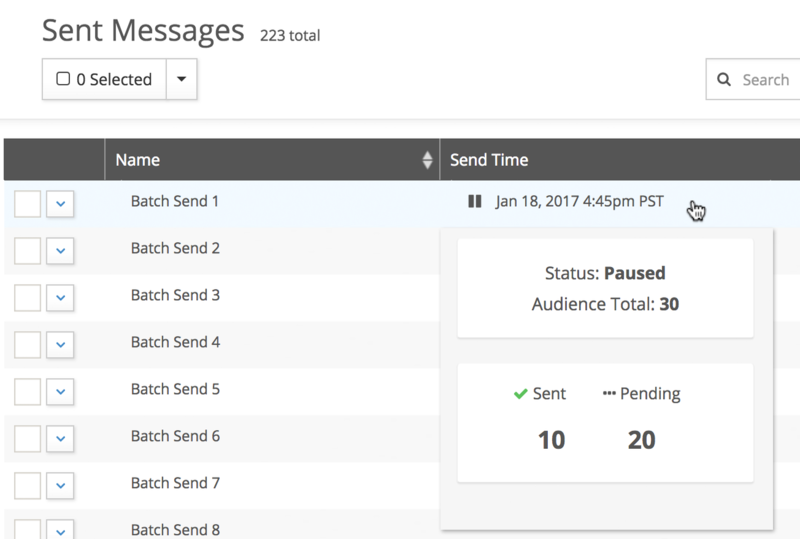 If an audience changes during the message pause, any new contacts will be added to the send upon resuming. Contacts will never receive the message more than once. You discover there is an error in your message body after you've already started sending. Copy the cancelled message as a draft. Update the audience to exclude any recipients of the original message. Hover over the arrow next to the message name and select Cancel. Once a message is canceled, it will be denoted with the canceled icon in the Send Time column.